This blog describes the Internal Working of TreeMap. This is a Binary Search Tree. Similar to java.util.TreeMap. 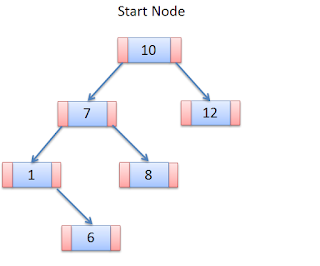 Binary Search Tree (BST) is a Data Structure which places the data in sorted order. Each Node has 2 pointers/references left and right. If the data to be inserted is smaller than the current node than the new node is attached at the left of the current node. If the data to be inserted is greater than the current node than the new node is attached at the right of the current node. In case the data is less than current node and if the current node already has a node attached to the left than the left-attached-node data is checked. This is recursive till the left node is null. Same is done for right node if the data to be attached is greater than current node. Below is the program with detail comments.